“Mr. 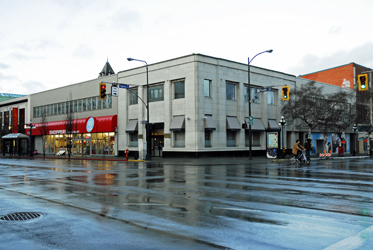 Jewell, furniture dealer , has just moved into his new building on the corner of Yates and Douglas streets .On the ground floor he occupies a large and commodious store, well stocked with furniture and crockery. 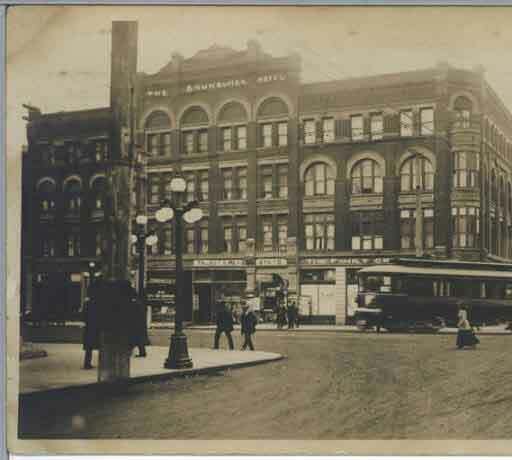 In April 1900, Mowat and Wallace (the clerks who for years waited on you at Erskin Wall & Co.) opened a brand new grocery store in the Brunswick Hotel. Between 1903 and 1905, W O Wallace assumed total ownership and advertised as such. The newspaper ad for the week that the trolley travelled past the store is for fresh Salt Spring Island butter, fresh cream and strawberries. The hotel was demolished and replaced by the National Trust Building, originally built for the Dominion Bank and designed by Douglas L. Kertland of Toronto, in a late Art Deco style in 1938. It suffered significant loss of architectural integrity in a 1964 renovation.